I have always tried to give my toddler a variety of foods. I always try to make what he likes to eat, often asking what he would like to eat so I can make him something, especially for him and that he is likely to eat. He has his own little table and chair that he sits at to eat which is situated in the kitchen so that I can be nearby when he is eating but he just does not seem to be very interested in food at all and he keeps getting up and walking away to play with his toys. What can I do to get him interested in eating? 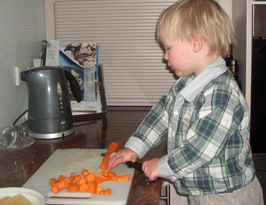 As well as being a necessity for growth and healthy development eating is also a social habit. As adults, we know that when we eat by ourselves much of the enjoyment is lost. It sounds to me like your son eats by himself every evening and he does not find this experience very enjoyable, choosing instead to wander off to play with his toys. You might find that he would enjoy eating much more if someone else were eating with him. The ideal situation is for him to eat at the table with the family every evening but it may be that this is not always possible and so you should see if you can find some time to just sit with him at the table while he is eating, perhaps even taking a small snack so that he feels that you are sharing this time of eating together. You might feel that his appetite starts to pick up when eating is associated with a happy time of being together with the people he loves. There is a myriad of conflicting advice available from books, grandmothers and the internet about when you should start to give your child something other than breast milk. What is your advice? The best approach is to be guided by the biological development of the child. At first your baby is only able to digest milk, and breast milk has the perfect balance of nutrients for his healthy development. But when your child starts to have teeth he is ready to eat something that he can use his teeth for and when he can hold something in his hand he is ready for finger food. 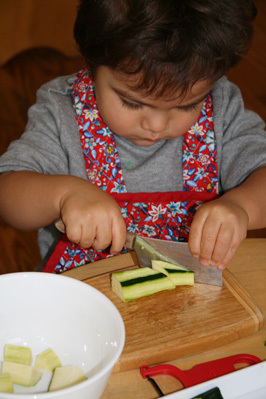 I love your ideas about helping children to prepare food and it is certainly helping to solve my little girls eating issues but I am still very nervous about giving her a knife to cut a banana or a glass that could break if she drops it. Won’t she hurt herself? This is an understandable fear. We are not used to the idea of giving potentially dangerous things to small children. But, in reality these things are only dangerous when we don’t know how to use them. It is important that you show your child how to carry and use the knife so she doesn’t hurt herself. Use very precise deliberate movements to show her exactly how to hold the knife. Start out with a knife with a rounded edge. This is certainly sharp enough for cutting a banana and you can graduate to a sharper knife when she has developed some capacity to use the knife safely and needs something sharper for cutting vegetables. When we show children how to use glass and breakable utensils it is inevitable that there will be some breakages to start with, but the feedback that they get from the fact that it does break if you drop it on the floor helps them to handle it more carefully the next time. They don’t get this feedback from plastic cups and so it takes them much longer to handle things carefully.